Due to its popularity, the Nepal Extreme has become somewhat of a synonym for the leather B3 mountaineering boot. Effectively an insulated version of the La Sportiva Nepal Top, the Nepal Extreme’s popularity stems from its excellent durability, relative warmth and of course its trademark yellow leather. The leather upper (3+ mm water-repellent Idro-Perwanger) offers great durability and water resistance. This will come as a pleasant surprise to anyone used to synthetic/fabric uppers on boots, where the uppers may only last roughly 20 days before water resistance becomes seriously compromised. In contrast the Nepal Extreme uppers seem to cope with repeated abrasion and reproofing; retaining their water resistance far better. 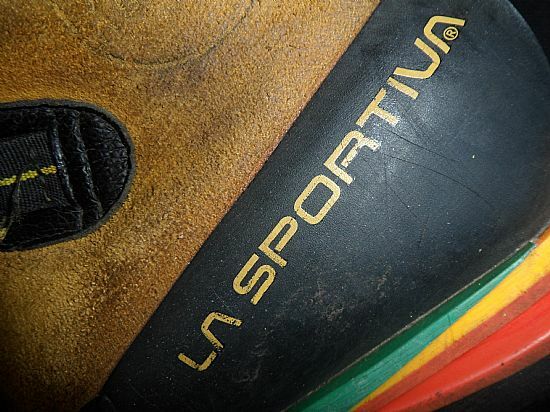 In conjunction with the leather upper, the La Sportiva Nepal Extreme’s also feature a high protective rubber rand. 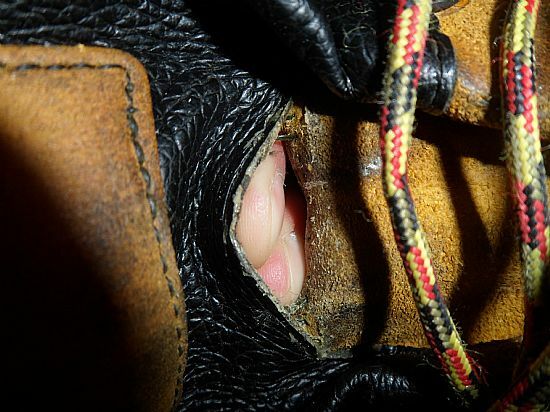 This helps to protect the leather from abrasion and to keep the lower section of the boot relatively snow free. Two clever innovations, the lace lock system and EZ out, help to make getting the boots tight and removing them easier. The lace lock system retains the laces in place from the foot before lacing the ankle; this allows different levels of tension to be applied to the foot and ankle, whilst also making it far simpler to tie the laces with gloves on or with cold hands. 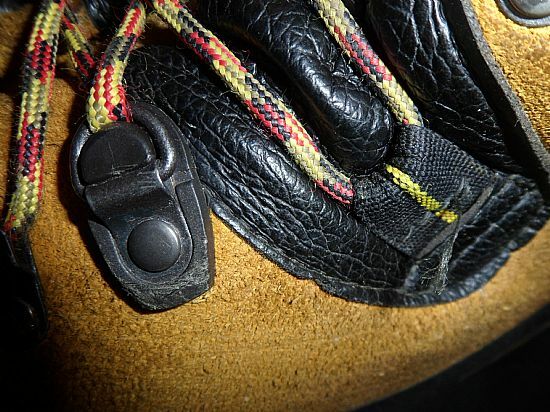 The EZ out is the nylon loop which releases the lace lock in turn loosening the laces across the top of the foot. The La Sportiva Nepal Extreme features a Vibram sole. This offers good levels of dexterity and traction on a wide variety of terrain types. However, for those who seek absolute performance there are many other boots currently available which offer thinner sole units and dedicated climbing zones which offer better feel whilst climbing. In contrast the sole on the Nepal Extreme has a deep tread pattern, giving longer life between resoles and perhaps most importantly it works excellently for kicking steps in hard snow. 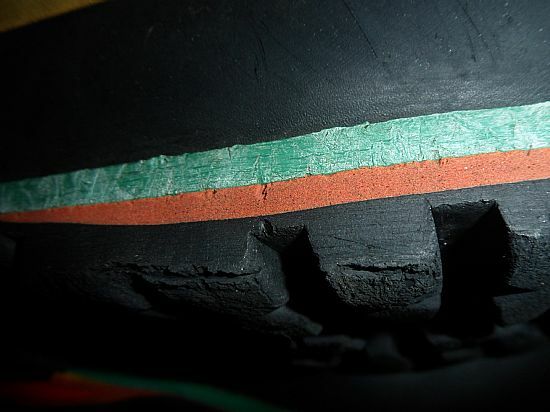 The tread pattern works almost like a saw, breaking the crust of the snow and clearing it with one step (with good technique) versus the smaller tread patterns on some modern technical boots where kicking steps can take a few goes. Great durability, significantly outlasting synthetic/fabric uppers. Excellent water resistance with correct reproofing. Warmth; dedicated Thermal Synergy lining in conjunction with water resistant outer fabric offer better warmth retention in comparison to e.g. Scarpa Charmox GTX. Weight is arguably the Nepal Extreme’s biggest downfall. Laces tend to trap snow; in contrast to many modern mountaineering boots with built in gaiters. 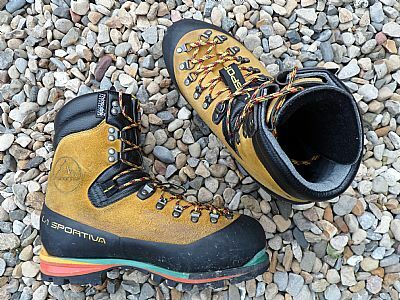 The La Sportiva Nepal Extreme is perhaps the most iconic B3 mountaineering boot of all time; delivering great durability and water resistance. However, its reign is arguably coming to an end as technical innovations mean that similar levels of warmth and durability can be achieved with less of a weight penalty (e.g. La Sportiva Nepal EVO gtx) or better climbing dexterity and feel with a significant weight reduction (e.g. Scarpa Phantom Ultra). The question for customers now is whether these new innovations can justify the extra costs over an established design.